Discussion in 'Designers and Collections' started by Lena, Feb 14, 2004. CHRISTIAN DIOR Couture embroidered jacket, corset, tulle skirt and brooch. CHANEL Haute Couture silk dress, tulle bolero jacket with silk ribbon sash and shoes. VALENTINO Couture silk dress with enbroidered bustier. Valentino earrings. ATELIER VERSACE silk taffeta gown with beaded leather and suede bodice and shoes. GAULTIER Paris embroidered satin chinoiserie gown with silk sash, coral bracelets and shoes. 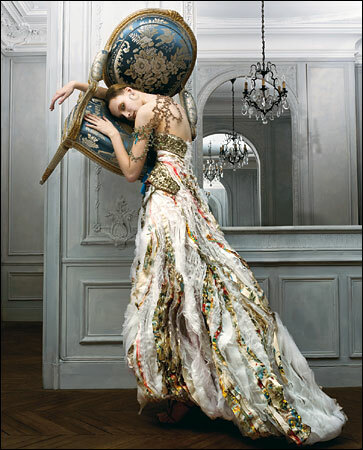 CHRISTIAN LACROIX Haute Couture dress with antique silver embroidered bustier and layered taffeta and organza skirt. amazing model, does anyone know who she is? Wow! Thanks for posting this, Lena! The pictures are wonderful. It made the couture outfits even more gorgeous! Thanks again! You almost can't believe your eyes. Fashion pours out of every medium today -- television, magazines, the Internet, art lectures. If things keep going at this rate, someday we'll drive up to one of those modern gas pumps with the built-in TV set, and instead of watching a report on the plight of the timber wolf, we'll see the latest Versace show. The trouble, of course, with all this overexposure, is that it has dimmed our visual sense. We've lost the capacity, if not the will, to distinguish the truly amazing from the merely beautiful. Well, that's what haute couture exists for. Until you've seen an haute-couture dress, you haven't seen anything. Although the number of influential Paris houses has dwindled to a handful, there has been no slackening in creativity. 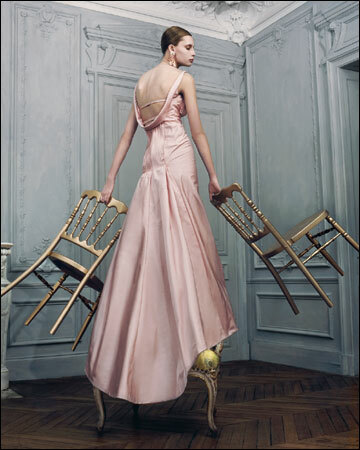 Since the entire raison d'etre of couture is to continue to make things by hand in spite of the costs, the spring collections rose to the challenge -- Christian Lacroix with his French pastry layers, Karl Lagerfeld with his blouses of voluptuous tulle. The next time you eye an actress on the red carpet, ask yourself: Is her dress milquetoast or mille-feuille? And as if to prove that couture has not become a crepey old widow without interest, the collections this season produced a real trend: the super-elongated line. Evident at Chanel in Lagerfeld's sinewy skirts and Jean Paul Gaultier's chinoiserie silks, it reaches its extreme at Dior, where John Galliano draws on ancient Egypt and 1950's fashion to create severe verticality. Corsets help. Thanks too for the article. I so agree with Cathy on why couture should exist! The Dior & Versace dress look GREAT! these photographs are absolutly amazing. Fantastic photos. Like Magritte. 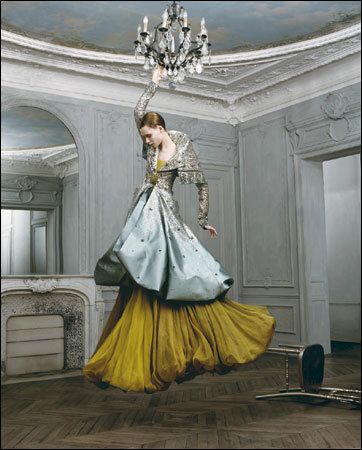 The hanging Dior and the never-ending Lacroix are particularly magical. Thanks for posting them and the article, Lena. When Cathy Horyn writes this way, I can totally see her as a magazine editor-in-chief in the not-to-distant future. One of the funniest headlines The Daily ran during Spring 04 read, "Does Cathy Horyn Secretly Like Fashion?" That no-nonsense attitude is emobided in this NYT piece along with a feeling of awe in seeing these gorgeous clothes. The Versace, Gaultier and Dior dresses are amazing. I love Gaultiers magical prints and Versace's beading. Tiiu did an awesome job and the whole theme for the pics is awesome, love the floating objects. Okay, it's official, I love Tiiu. She is (in my opinion) drop dead gorgeous. Then she was SO professional after her fall. Now she is such a great couture model, as shown in these pictures. Sorry for the off topic-ness! Thanks so much for posting the photos! Absolutely stunning. I Tiiu even more now!! !